Sometimes it happens to everyone – you create a really cool vector illustration and want it to submit and sell on microstock, but you found, that the exported EPS file is too big. What can you do, to make the EPS file smaller? 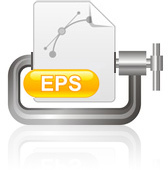 Here you will find several tips and tricks for reducing the EPS file size. September was the Best Month Ever (BME) for me in microstock. And I’m awaiting that another BME will be in October and also in November, because in those months are the microstock earnings the highest for every year (you can check it on my last graph in the article). I had also the BME on Shutterstock and Dreamstime. Another discount coupon for Pixmac: For any purchase you do on Pixmac with this code: PX100079, you will get 10 credits for free! The code is valid to 2009–12–09. For any purchase you do on Pixmac with this code: PX50078, you will get 5 credits for free! The code is valid to 2009–11–20. August was quite a weak month – my sales drops to the March level. And it looks like August was weak month also in previous two years (in 2008 it was because my account on Shutterstock was disabled for several days). The sales went down on all my accounts, except Fotolia. Check out 123RF & enter promocode tan8ibL3 on during your purchase for discounts. Message from today’s 123rf twitter feed. Well this is another article about iStockphoto application quiz (check the quiz for vector illustrators and for photographers) – this time for flash developers. The quiz is really easy and consists of four questions only. Don’t forget to read the Stock Flash Training Manual before uploading your flash files (it will save you some rejections). I got a promo discount code from Shutterstock. So if you want to save 10% – use this link, register and then apply this coupon: TWEE10. Coupon is from direct message from Shutterstock twitter account. In July, there was not any surprise in the overall earnings for me – July 2009 was just a little bit worse than June – it is very similar as in the previous years in microstock – check the last graph in the report, where you can compare the earnings since 2007. Only on iStockphoto I had the BME (without any extended licence) – last image was added to my iStock portfolio in May!